Our country is at war. We are fighting a war against ourselves. Prescription and non-prescription opioid abuse has risen to epidemic proportions. Statistics from the CDC are staggering. Every day in the US, 44 people die of prescription opioid overdose and over 7,000 are treated in ER’s across the country. Over 2 million people in the US are currently addicted to prescription opioids. Prescription opioid abuse has become a reality in every ER and primary care clinic in the US and increasingly across the globe. One of the challenges facing primary care providers is how to deal with the complex conversions of one opioid analgesic to the next. We are commonly evaluated on our performance measures for chronic pain patients including how many morphine equivalents our patients are taking. What if you want to convert a patient from morphine to fentanyl or to oxycodone? We call this equianalgesic dosing and is frequently performed for unwanted side effects of one drug or for a more preferred route of administration (converting a patient from IV to PO or to transdermal). If done improperly, the results can be catastrophic with either opioid withdrawal or worse respiratory depression/overdose. 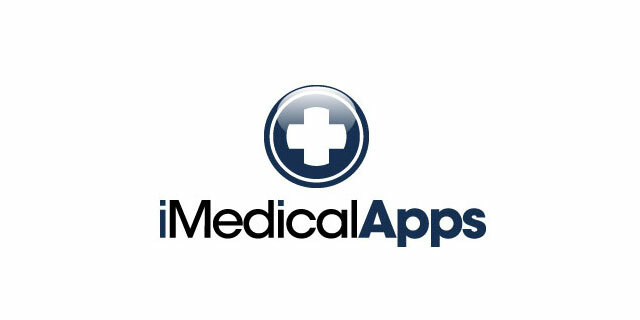 Here on iMedicalApps we previously found that many of the available opioid conversion apps lacked consistency. Some apps such as Opioid Risk Tool contained excellent information, but were implemented poorly leading to difficulty just inputting doses of meds. eOpioid on the other hand appeared to be an orphaned app with a steep learning curve. One of the newest opioid conversion apps to enter the fray is Opioid Calculator. This app was developed by the Faculty of Pain Medicine of the Australian and New Zealand College of Anaesthetists (FPM ANZCA). This organization is charged with the development, training and continuing education of pain medicine specialists in Australian and New Zealand. When you open the app, you see a short description of the app’s purpose and information about the app’s developer. Along the bottom are several icons including the home button, information button and a messaging function to share the app. Along the top is the conversion tool. The app allows you to enter the doses of medications directly using the keyboard or by simply using plus and minus signs. Once you have entered the current dose you then select the drug for equianalgesic dosing. The information sections contain detailed information about patient evaluation, the evidence for/against opioids for non-cancer pain, a demo for the app, even a link to the FPM ANZCA online curriculum for providers. The app comes from a very reputable organization that oversees the training of pain medicine providers in Australia and New Zealand. The organization does appear to receive some funding of their online curriculum from pharma, but the app appears to be free of any drug company funding. If anything, the organization’s position statement is very balanced and clearly shows the lack of convincing evidence for the long term use of opioids for chronic non-cancer pain. Simple to use interface with excellent demo and outstanding references. Multiple ways to input drug doses to ensure accurate data entry. App allows for selection of medications based on country/location. Links to other online resources and provider training (extra cost). Main function of app could be easier to see from the main screen. Information on proper dosing included as appendix rather than part of main screen. Not available for Android at this time. Opioid Calculator appears to break the curse of opioid conversion apps that are difficult to use and/or do not reliably allow for data input. 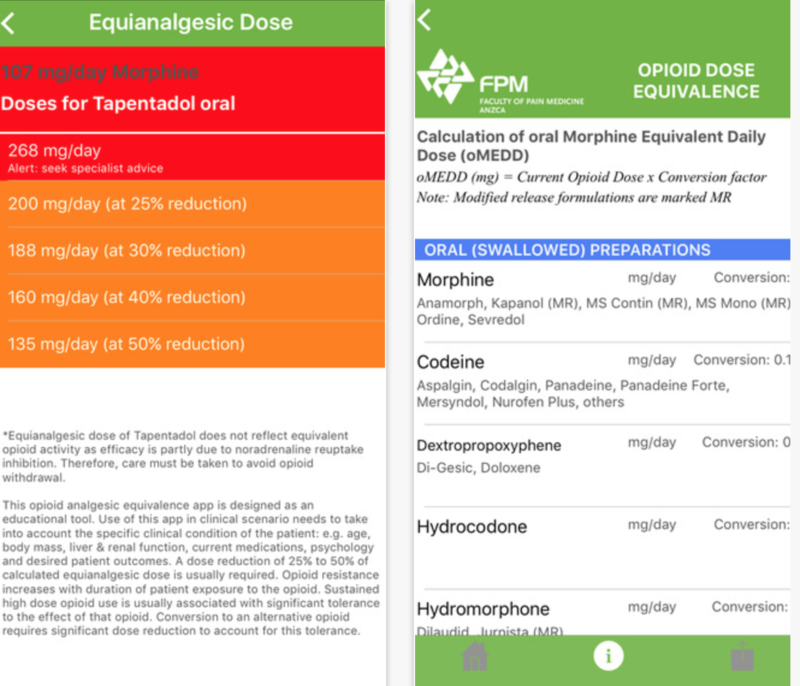 The app, developed by a respected pain organization in Australia and New Zealand, should be strongly considered by providers looking for an easy to use and accurate app for equianalgesic opioid dosing. Design is easy to use and allows for precise and accurate data entry. App has ability to link to outside references, resources for ongoing training and ability to share app. A simple app that could become the go to opioid drug conversion app for many providers.